The success and growth of an apparel manufacturing business depends on how well cross-department production information is delivered, handled and executed in real time. What is required is a reliable platform to fulfill all these aspects of business. Radio frequency identification (RFID) technology is the call of the hour to improve the operational flow in such a complex environment of apparel production business. It collects and analyzes production data during the entire production workflow on a real time basis. This specifically deals with common production problems encountered on the shop floor. If I talk about production, an RFID system not only obtain information about production quantities in real time basis but also traces the efficiency of each lines, traces the performance of each sewing machine and each workers. Most importantly it detects the source of the problem in real time. It shows who is working in which bundle, fast resolution of bottlenecks and rapid tracing of quality issues to their source. 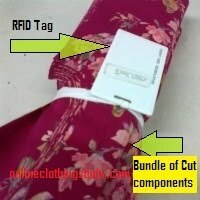 RFID technology is becoming a popular tool for factory management in the apparel industry. Although this service is offered by many solution providers in various areas, the functions of those systems are quite similar to each other. Main components of the system are RFID software, computer, data cable, RFID card, RFID scanner, RFID reader and terminal to display information to the operator. In real time RFID system, data is captured through scanning of RFID cards (tags) at operator terminals (workstation). Generally, four types of tags are used in the line which can be an employee card, bundle card, supervisor card or a job card. Employee card: Employee cards are issued to operators and checkers. Operator uses employee card to sign on at his/her workstation. If operator does not scan the employee card system keeps her absent for the day. One more important thing, without scanning the employee card operator would not be able to scan bundle cards at his/her terminal. Bundle card: Bundle cards carry a unique number (bundle no.) that is made in computer to represent the bundles such as garment size, no. of pieces consist in bundle etc. Bundle cards are attached to each bundle as similar to bundle tickets. When operators work on the bundle they scan bundle card to the terminal. One or multiple cards are issued against each bundle depending on the production system. For example, when garment is made on sections (preparatory sections) and assembled at the end for each sub-bundles duplicate cards are issued. In some RFID systems, bundle card is inserted to the slot of the terminal while operator sews garment instead of scanning. Job card: Job cards used to assign jobs at the terminals (workstation). Job cards are also used for special purposes. Normally, each terminal (work stations) is pre-set with the operation/job that would be performed by the operator. There may be possibility that operator had to do multiple jobs. In that situation, operators use job card to change the operation in the terminal. Jobs cards are labeled with job (operation) name and number. Operator scans the job card of the job that will be performed by the operator. Supervisor card or maintenance card: This system has option to record off-standard work and lost time. To authenticate those lost time approval by supervisors or assigned person is needed. Also when machine breakdown is reported by operator and the issue is solved by the maintenance, they scan their card to stop the lost time request. The process flow of the system has been explained in the following. Data preparation: Data preparation consists of task such as listing of operations for the style Assigning of SAM for each operation. Listing of employees, supervisors Listing of machine type and class. Create bundles for each cut (lay). Assigning job/operation to the terminal: In the line, each operator would perform specific job. Prior to start work on the workstation operation is assigned to the terminal (workstation). Assigning of job can be done by using job cards or entering job number to the terminal. Issuing card: According to the bundling done by the cutting department, RFID cards are scanned by RFID scanner to assign bundle number to the cards. Assigned cards are issued to the cutting department. These cards refer to the bundle numbers created on the computer. Bundle numbers includes information such as quantity of garment, size, color etc. Bundle cards are then attached to the bundles. Scanning of cards at terminals: Each operator scans bundle cards (at RFID reader that fixed on their work station) and start working on bundles. When operator finishes the bundle, he/she ties the RFID card with bundle and keeps aside or moves to the next operator. Once operator scans the card, information related to that particular bundle will be stored and displayed to the computer. Viewing report: System records all transactions made by operators and supervisors. System analyses the records and display reports on the pre-set format. Modification of digital information can be possible by administrator. For example, system gives report of individual operator’s efficiency. Now how system calculates efficiency? To calculate someone’s efficiency system needs two types of information – how many minutes operator has produced during the day and secondly how many minutes operator spent or present (sign in) at his work. First information is calculated through total bundle scanned (total pieces) and multiplying the pieces by SAM of each pieces (for the operation). Second information is captured from employee card scanning data – at what time they sign in at the terminal and at what time they sign off from the terminal. RFID system captures all the information through RFID scanners and stores them in the database. Whatever report one needs can be displayed retrieving data from the data source. Also see: How to stop missing of garments in production processes?